How can everything be a blur when we were moving at the speed of a walk? Miles and miles of walk. At last we’re seated, in the cool dark of the Westin Hotel near the Place de la Concorde – not because we’re guests here but because of the Internet and the bathrooms, and because it’s cool and dark. Aren’t big, faceless hotels nice? No one is asking us if we belong, if we’d like to move along. What I’d like is a nap. I think their laissez-faire attitude might stop shy of a room. The rows of concrete rosettes on the underside of the Arc de Triomphe, stretched over our heads, over the head of the Tomb of the Unknown Soldier. Meeting the tiny dynamo of a woman on the Metro who has lived so many places that I’ve lived – South Florida, Michigan, Maryland – except I was born in Massachusetts and she was born in Brazil. She and her daughter waved goodbye and jumped off the subway at the Eiffel Tower stop. The Eiffel Tower, around which the city turns, appearing unexpectedly around a building or over the treetops, slowing me, the blur clearing. Colors quiet and become solid. Near the foot of the Tower are cafés. I don’t know one from the next, but I’m drawn to the red awning and the wood chairs burnished shiny rich having been polished by the sliding on and off of so many derrieres. The peach-strawberry smoothie at Haagen-Dazs along the Champs Elysées: cool and quenching – and only 7 euros! Store upon store upon store of expensive everything. It’s fun to look in the window of Cartier. And funny that the giant clock hanging outside the Rolex store gives the wrong time. The City of Light is known for being a walking town – as in to know the place by walking it, to be le flâneur. I fear if I travel any faster than a walk my head would never stop spinning and I would have seen all these fabulous sights for nothing. 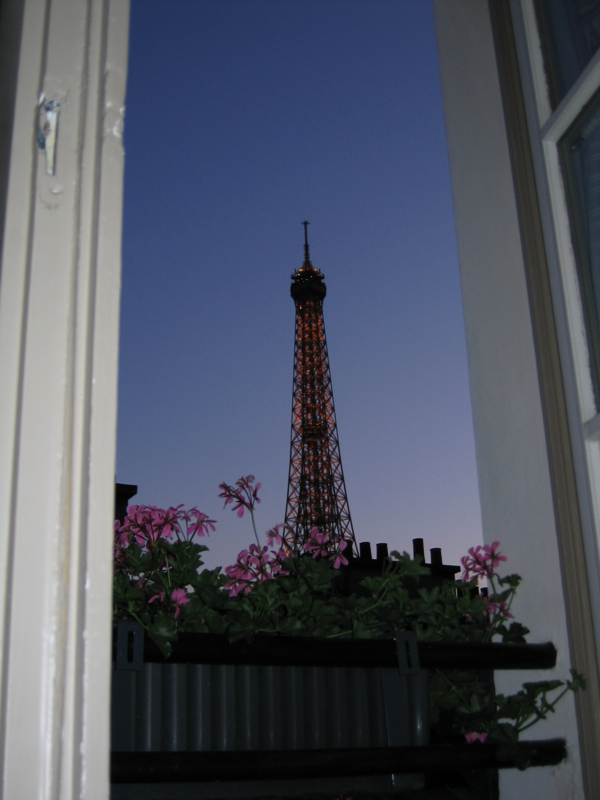 Nor would I appreciate so much at night settling into my room, with a view of the spindle that is the center to this whirling hub – Le Tour Eiffel – filling my view, bright on dark, until my eyes close, and I feel no more blur.